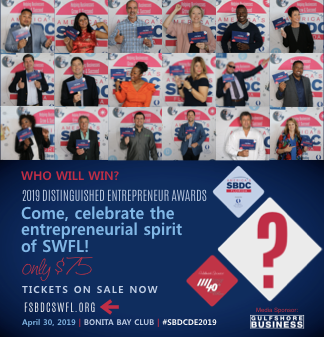 The Florida Small Business Development Center (FSBDC) at Florida Gulf Coast University (FGCU) announces the 2019 Finalists for the 2019 Distinguished Entrepreneur Award of SWFL. Samantha Scott, Pushing the Envelope, Inc.
Now in its eighth year, the award recognizes a small businesses owners Southwest Florida business for their overall success and provides an opportunity for the local business community to celebrate their achievements. The 18 finalists were selected from a pool of 66 nominees from the five-county area of Southwest Florida and contend for one of three awards including; the “Distinguished Entrepreneur of the Year”, “Small Business Advocate of the Year” and “Distinguished Innovator of the Year”.